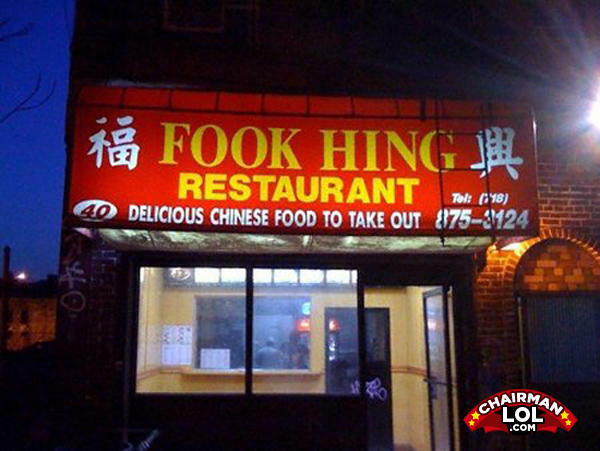 They want to make it clear that they're a fook hing RESTAURANT, damnit! Oh my weekend was great, last night we ate at.... say, what was the name of that fook hing place again? Dude 1: Hey, where did you order that Chinese food? Dude 2: At a Fook Hing Restaurant. Dude 1: Geez dude, I was just asking. No need for the attitude. Boy- I'm heading back to my place. Want to come? Girl-Sorry you strike me as a person who cums all by himself.